Township on the Canterbury Plains, Selwyn District, 22km south-west from Christchurch City centre, 35km north-east of Rakaia. Railway station at the junction of the South Island Main Trunk line and the Midland West Coast line, 22km south-west from Christchurch. Primary school, licensed hotel, shops. Named after colonial statesman William Rolleston (1831-1903), Superintendent of Canterbury Province 1868-76. ROLLESTON GLACIER, RIVER - Reputedly the northernmost glacier in the South Island, the Rolleston Glacier lies on the eastern flank of Mt Philistine (1951m), Westland District, just north of Mt Rolleston (2271m) on the main divide of the Southern Alps. The glacier feeds headwater streams of the Rolleston River which flows north-eastwards around the eastern foot of the Barron Range to join the Otira River at the north end of the Otira Gorge. Named after Canterbury Superintendent, William Rolleston - see Rolleston, above. ROLLESTON MOUNT - A prominent peak (2271m) on the main divide of the Southern Alps, about 4km due west of Arthur's Pass; on the boundary between Westland District and Selwyn District. In the Arthur's Pass National Park, Rolleston is surrounded by glaciers - notably the Goldney on its eastern flank, the Crow on the south side, and the Rolleston to the north - said to be the northernmost in the South Island. The low peak of Rolleston, at 2211 m about 400m south-east along a ridge from the main peak, was ascended on 27 December 1891 by mountaineers George Edward Mannering, A.M. Ollivier and W.D. Wood, who were unaware of the existence of the higher peak because of foggy conditions. The first ascent of the main peak was made in 1912 by climbers H. Thomson and J. Gilligan. Named by surveyor (Sir) Arthur Dudley Dobson at the time of his discovery of Arthur's Pass In 1864, after Canterbury Superintendent, William Rolleston - see Rolleston, above. ROLLESTON RANGE - Lateral range of the Southern Alps, trending from Mt Algidus (1404m) at the junction of the Wilberforce and Rakaia Rivers, north-westwards between the Mathias River and the Wilberforce, to Mt Bryce (2205m) on the main divide, Selwyn District. Named after Canterbury Superintendent, William Rolleston - see Rolleston, above. 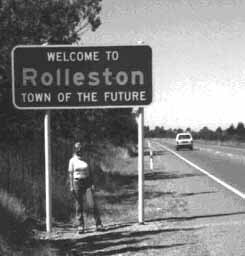 Rolleston is a township on the Canterbury plains in Selwyn district. It is 14 miles to the southwest of Christchurch and 22 miles to the northeast of Rakala. 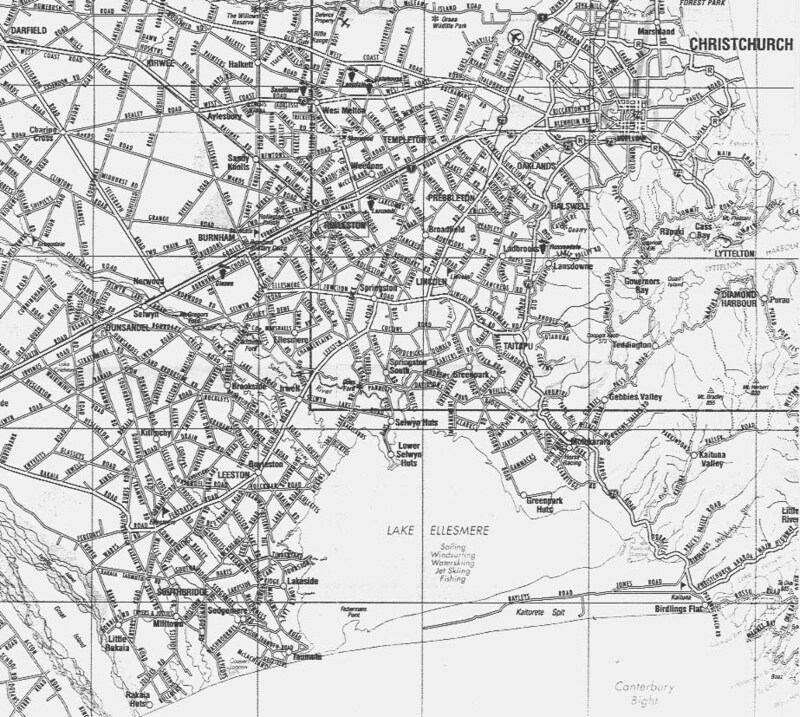 It has a railway station at the junction of the South Island Trunk Line and the Midland West Coast Line. It has a primary school, shops and a licensed hotel. It was named after a colonial statesman, William Rolleston (1831 – 1903), who was Superintendent of Canterbury Province from 1868 – 1876. The earliest mention of the name of the settlement was in 1866, when William Rolleston led the debate about railway routes, gauges and the location of stations, shortly after coal had been discovered in the Malvern hills. He was born at Maltby Hall in Yorkshire in 1831 and had graduated from Cambridge University before going to New Zealand in 1858. He worked as a shepherd before taking up his own sheep-run called Mount Algidus. In 1863 he was elected as Secretary and Treasurer of the Canterbury Provincial Council, and five years later as Superintendent. His parliamentary career began in 1865, when he was Under-Secretary for Native Affairs and later Minister of Lands. At the time when the town was named after him, he was prospecting for gold on the west coast. He died in 1903, and is buried in Holy Trinity churchyard in Avonside. His statue stands outside the museum in Rolleston Avenue in Canterbury. Rolleston Mount is a prominent peak (2271m) two miles west of Arthur’s Pass on the main divide of the Southern Alps, on the boundary between Westland District and Selwyn district. Rolleston Mount, in the Arthur’s Pass National Park, is surrounded by glaciers, notably the Goldney Glacier on the east flank, the Crow Glacier to the south and the Rolleston Glacier to the north, said to be the northernmost on South Island. The low peak of Rolleston Mount (2211m) was ascended on 27th December 1891 by mountaineers G.E. Mannering, A. M. Oliver and W. D. Wood, who were unaware of the existence of the higher peak because of foggy conditions. The first ascent of the main peak was made by H. Thomson and J. Gilligan in 1912. 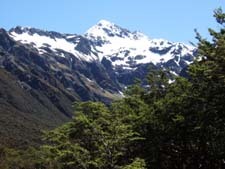 Rolleston Mount was named after William Rolleston by the surveyor Sir Arthur Dudley Dobson at the time of his discovery of Arthur’s Pass in 1864. Rolleston Glacier, on the eastern flank of Mount Philistine, feeds headwater streams of the Rolleston River which flows north-eastwards around the eastern foot of the Barron Range to join the Otira River at the north end of the Otira Gorge. William Rolleston also gave his name to the Rolleston Range of the southern Alps, running from Mount Algidus north-westwards between the Mathias and Wilberforce Rivers to Mount Bryce. Before the arrival of white settlers, the area was not cultivated by the Maoris, but there were settlements around Lake Ellesmere, and groups travelled from there to the Waimakariri and the West Coast in search of greenstone. According to Maori tradition, the region was covered in forest until about 1700, when it was cleared by a moa-hunter called Tamatea. Instead of trees, early settlers found tussock, up to six feet high, of manuka, matagouri, speargrass, broom, flax and cabbage trees. It was not unknown for children to get lost in the tussock and die of exposure. When New Zealand became Crown Land after the Treaty of Waitangi, the land between the Waipara and Ashburton Rivers was administered by the Canterbury association, which sold land at high prices to build roads. Land around Christchurch sold quickly, but further out was leased out in runs at a farthing an acre. From 1851, Australians, driven out by the drought arrived with their Merino sheep and within four years the whole of the Canterbury Plains had been taken up. A new leaseholder would live in a tent until he built a house of sod “bricks”, which was later replaced by a building of black or white pine. He would burn off the land and stock it with sheep, riding his boundaries once or twice a day until he could fence it with sod bricks with gorse sown on top. To keep his lease, he had to have at least one sheep to twenty acres. When he had built his house, his family would join him, and the “petticoat pioneers” kept the house and cooked mutton and bread in stoves fired with brushwood and tussock. Lighting was by mutton dips. Babies were born at home with the help of other local women. An almost feudal system grew up, whereby someone who owned a horse, which cost as much as a labourer’s yearly wage, would hire it out in exchange for labour such as fencing. Until 1867, only single-furrow ploughs were used, and it took a day to plough one acre, at a time when a large holding could consist of several thousand acres. At first there were no tracks, and travellers got their bearings from a landmark such as a tree or a mountain peak. Later, a straight line was ploughed that could be followed even when the weather was not clear. The Main South Road was not sealed in concrete until 1929, and covered in a mixture of bitumen and shingle in 1932. In 1866 the railway line was opened from Christchurch to Rolleston, the first section of the “Great Southern Railway”. The first Rolleston stationmaster was paid £163.16.0 a year, at a time when a labourer got £75. At peak times there was a third class service, when cattle-trucks were cleaned and fitted with seats. The first licence was granted to William Lawrence in 1867. As part of the licence, he had to provide stabling for horses and accommodation for drovers. In 1930 the Hotel was “suspiciously destroyed by fire”. To keep the licence, staff had to establish a bar within 24 hours, so a house was brought out from Christchurch and was used while the present hotel was being built on the old site. At the time whole buildings were sometimes jacked up onto tree trunks and skid-dragged by traction engine to a new site. The School opened in June 1893 with 36 pupils and, by the end of the year, there were 56, of whom one died, 15 moved away and only one went on to secondary school, the others going to work on farms. The building was one room with a head teacher and an assistant who took the infants. Because the pupils had to do chores such as milking before school, lessons started at 9.30. The school had a swimming pool, but no water, so it was filled in again after a child fell in. The present school has more than 200 pupils. There has never been a denominational church in Rolleston. In the early days, services were held in private homes or in Weedon’s Methodist Church, to which people had to travel on foot or horseback, but in 1964 the first combined Anglican-Presbyterian- Methodist service was held in the Memorial Hall. The “Union” Church was opened in its present building in December 1973. Sandy Aitken has provided the following photos. First is of Rolleston Community Centre, unfortunately not here, but in Rolleston (near Christchurch), New Zealand. Second, also from Rolleston NZ, shows a view familiar to us, a class of children en route to (or from) school. Third, still in NZ but near Arthur's pass, between Christchurch and Greymouth, is 'our' mountain, Mt. Rolleston. 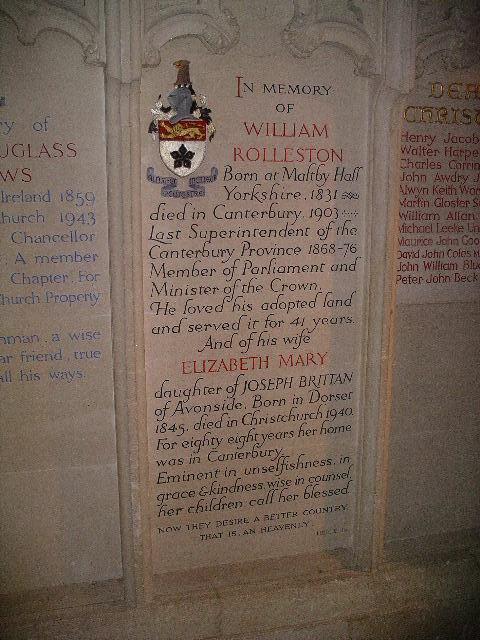 'Ex Rollestonian' Richard Wedd, now living in Australia, sent the above addition to the Rolleston, NZ page - a memorial located in Christchurch Cathedral. He writes "I failed rather miserably in my efforts to photo Rolleston even though we went through it on the train and also by coach. The coach was a bit late so I couldn't ask for a mini tour around!! Rolleston (pronounced Roll-es-ton) is fast growing into a commuters hub for Christchurch as it's only a relatively short drive."